When you go on a hunting expedition, it is highly imperative that you use the right supporting equipment or gear in order to ensure your safety and make the hunting trip as comfortable and successful as possible. One of such essential equipment is a good pair of hunting boots. 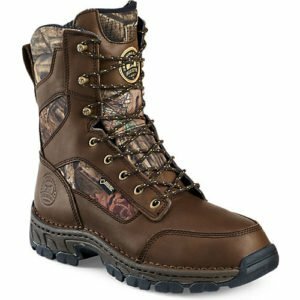 Talking about good hunting boots, I would like to use this opportunity to introduce to readers the Irish Setter Men’s 840 Havoc WP 800 Gram 10″ Big Game Boot, which is one of the popular brands of hunting boots currently available on the market. In this post, we shall explore in detail the Havoc Boots’ major features, PROS and CONS as well as some of customers’ most frequently asked questions. Hopefully at the end of the review, you would be armed with sufficient information about the Havoc Boots to decide for yourself whether you want the boots or not. 1.8.1 Q. What is the height of the boot? 1.8.2 Q. What is the weight of the boot? 1.8.3 Q. How do I clean the boots? 1.8.4 Q. Can I use soap to clean the boots? 1.8.5 Q. What is the best way to store the boots? 1.8.6 Q. Who are the manufacturers of the Havoc Boots? 1.8.7 Q. Are these boots snake proof? 1.8.8 Q. Do the Havoc Boots come with the renowned ScentBan™ that kills odor-causing bacteria in the boots? A hunting boot isn’t considered excellent for hunting if it does not have the ability to effectively repel water, which is why the manufacturers of the Havoc Boots designed the boots with the renowned waterproof GORE-TEX fabric lining to make them 100% waterproof and keep the hunter’s feet dry all the time. With the Havoc Boots, the hunter or hiker does not need to worry about getting his or her feet wet while in the field, thereby making the hunting or hiking expedition as comfortable as possible. In addition to the waterproof GORE-TEX lining, the waterproof leather upper that boots are made of also plays a major role in keeping water out and allowing the feet to remain dry. Some hunting boots that are waterproof tend to do a poor job with regard to air circulation, which leaves moisture to build up heavily in the interior of the boots, thereby making them uncomfortable to wear. But with the Havoc Boots, one does not need to worry about poor air ventilation or circulation since the GORE-TEX fabric lining also supports proper air circulation because it is a breathable membrane. What this means is that in addition to preventing water from the outside from getting into the boots, the GORE-TEX lining allows moisture (as a result of sweat) formed within the boots to evaporate, thereby keeping the feet dry all the time. The proper inflow and outflow of air also helps in preventing bad odor from building up in the boots. Another good thing about this boot is its CuShin™ Comfort tongue technology which works by significantly reducing the pressure the boot’s tongue puts on your shin. This makes wearing the boots quite comfortable – even if you wear them for extended periods. The Havoc Boots incorporate 800g of 3M™ Thinsulate™ in order to achieve a high level of insulation. Generally, the more insulation a boot has, the warmer the interior of the boot is going to be. And the 800-gram Thinsulate insulation that the Havoc Boots come with is enough to keep the interior of any hunting boot warm even in moist conditions. This is the reason why when you wear the Havoc Boots, your feet stay all day long – even during cold temperatures. The Havoc Boots come with rubber soles, which are slip-resistant. This is another great functionality of these boots that endears them to many hunters. Thanks to the boot’s grippy rubber soles with lots of traction, the hunter is capable of maintaining their agility and reduce their risk of slipping and falling even when they find themselves hunting on slippery terrain. They are very comfortable to wear right from the beginning. In addition to being lightweight, the boots are also very durable and can handle several miles of rugged territory with ease. Have slip-resistant rubber soles, which offer great traction on slippery surfaces. The boots are quality and durable. Boots greatly support the ankle and feet. Because of the warmth they provide, the boots can be worn for hunting in cold weather. The Havoc Boots incorporate a moisture-wicking nylon lining that effectively wicks perspiration away from the feet and keeps the feet dry, thereby enhancing comfort and reducing foot odor. The boots are not snake proof. Quite difficult to get on even when you are wearing thin socks. A. The boot is 10 inches in height. Q. What is the weight of the boot? A. The boot weighs approximately 4 lbs. Q. How do I clean the boots? A. Cleaning the boots is really simple. Since they are leather and waterproof at the same time, all you need is water and a piece of cloth to clean them. After you are done cleaning the boots, you can then apply good conditioners and leather protector to complete the job. Q. Can I use soap to clean the boots? A. Yes, you can. If the boots get too dirty, you can use soap to clean them. But it is imperative that the soap you use be a non-scented one. Q. What is the best way to store the boots? A. Since the boots are made of leather, the best way to go about storing them is to place them in a location that is dry and cool. Also, you should not store the boots in a place that has no direct contact with heat, sunlight or too much cold. Doing these simple things will not only make your Havoc Boots last longer, but it will also make the boots perform better whenever you use them in the field. Q. Who are the manufacturers of the Havoc Boots? A. The boots are manufactured by Red Wing Shoes, which is one of the most successful footwear companies in America. Q. Are these boots snake proof? A. Unfortunately the Havoc Boots don’t come with SnakeGuard construction, which means that it is possible that the sharp fangs of a snake can penetrate them. Q. Do the Havoc Boots come with the renowned ScentBan™ that kills odor-causing bacteria in the boots? A. No. The Havoc Boots don’t come with ScentBan™ that a number of boots from Red Wing Shoes do. The Havoc Boots are not only equipped with a lot of technological features that make them perform well in the widest range of situations, but they also have a great potential of making the entire hunting or hiking process quite comfortable and successful. Having read the Irish Setter Men’s 840 Havoc WP 800 Gram 10″ Big Game Boot review above, we guess you now understand why many hunters and other outdoor enthusiasts looking for comfortable and capable boots add the Havoc Boots to their top picks.